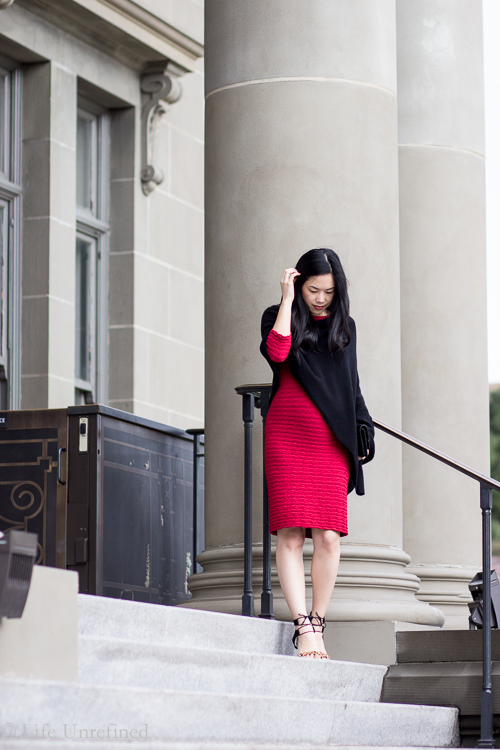 In the world of black dresses, a red one is extremely hard to find. Mr. Wonderful loves it when I wear red (and who doesn’t remember Julia Roberts’ fantastic version in Pretty Woman? Or Audrey Hepburn in Funny Face? ), but even in pre-pregnancy I only owned a few pieces. First, it has to be the right shade for your skin tone. The spectrum of red ranges from an orangey tomato to cherry to a burgundy hue, and despite fashion magazines telling me that all Asian women should wear red in orange-based tones, I know I look best in cherry red (maybe because I’m ridiculously pale). The claim made me think of those stretchy, ruched tops you sometimes see vendors selling in beach towns. Does anyone actually buy them? How is it possible that a size 2 can wear the same piece as a size 10? Or that a dress can look equally flattering on a slim woman as a full-term pregnant one? But this was Nordstrom, not a street vendor. And after doing a quick search, it seemed that other bloggers of all shapes and sizes were fans of this brand. So I decided to give it a try. Despite my disbelief, the dress is actually flattering. Pregnant belly and all. And really, really comfortable. Mr. Wonderful liked it and was curious if it would fit HIS body (I’ll stop there), and approved of the purchase despite the higher price. With my baby shower, birthday, and Valentine’s Day clustered within weeks of each other, I figured I’d get in at least a few wears before the baby comes. Hoping this dress will work post-pregnancy, too! Have you tried Tees by Tina? What do you think of the one-size-fits-most concept? I think “one size fits most” means that a piece of clothing is designed to be fitted and stretch, so you have to feel comfortable in fitted clothing in the first place. Just because you can get into it doesn’t mean it will be flattering. Of course, this dress looks awesome on you! 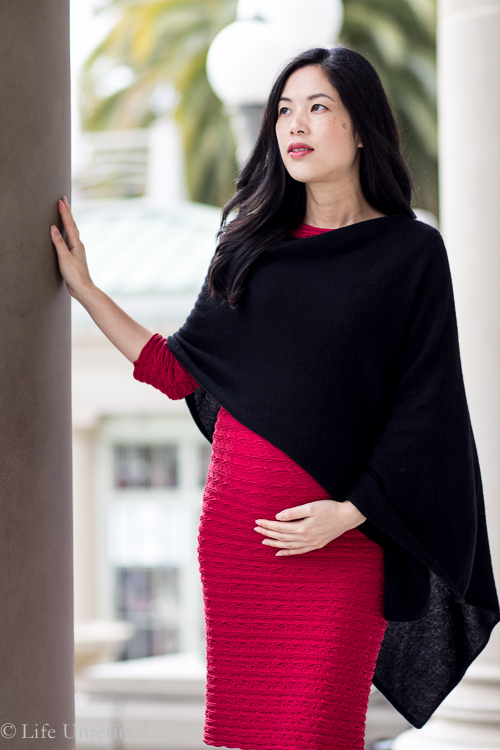 Jen, this dress is stunning on you and I love how you styled it with the asymmetrical poncho. Since this is one size fits all, I want to try too *hint, hint*! I love this outfit on you! The asymmetrical poncho really makes it more artistic and classy at the same time. I agree with Kristen that one size fits most is usually stretchy and tight fitted. Great pick!